Three versions of the Gourmet Casserole are known to exist. When released the Gourmet Casserole retailed for $6.95 and came with a cradle and candlewarmer. “Beautiful, Useful, Always Welcome…Pyrex Gifts,” proclaimed a 1961 advertisement for the holiday season promotional items. The new Gourmet Casserole retailed for $6.95. Included in this price was the 2 ½ quart Round Casserole (475), a clear lid and a cradle with candle-warmer. Three variations on the Gourmet pattern exist. 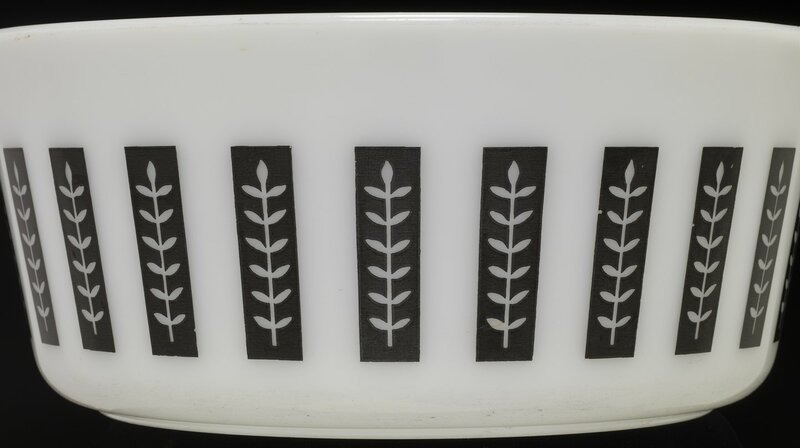 One is the gold pattern on the white background that appears in the ad, but also in existence are the black pattern on white background and gold pattern on yellow background casseroles. The gold on white has an opaque light blue delphite interior. The pattern is a series of horizontal sections alternating between a tall outlined vine with leaves and a solid vine with leaves. The exception is the black pattern on white where there is no solid color vine, but only an outlined vine.